Last weekend my friends Jennie and Zander came over for brunch. Jennie and I met over thirteen years ago, and some of our best memories have been shared over a good meal. But when we were younger, I thought Jennie’s food tastes were crazy. A life without meat or chocolate? The thought nearly knocked my head off. But now that some time has passed, I’ve broadened my own tastes and realized that some of the best flavors on earth involve neither meat nor chocolate. In fact, one can live a perfectly pleasant existence without what I consider to be culinary staples. Take this autumnal french toast recipe: it has both sweetness and substance. On parchment paper-lined baking sheet, toast bread in 300 degree oven for about five minutes on each side. Turn off oven and let bread cool. Whisk together all ingredients (when they have all been brought to room temperature) except for bread. Soak challah slices in wet mixture for twenty seconds on each side. Allow excess moisture to drip off and immediately put in buttered frying pan over medium heat. Let toast cook on each side for about three minutes, adding more butter if the pan becomes too dry. Transfer to oven (still warm from step 1) until ready to serve! Bring corn syrup, maple syrup, milk, brown sugar, and vanilla extract to a boil, whisking until smooth. Reduce to simmer and keep on heat for about five minutes. Toss pecans in spices. Pour syrup mixture over the pecans and toss until evenly coating. 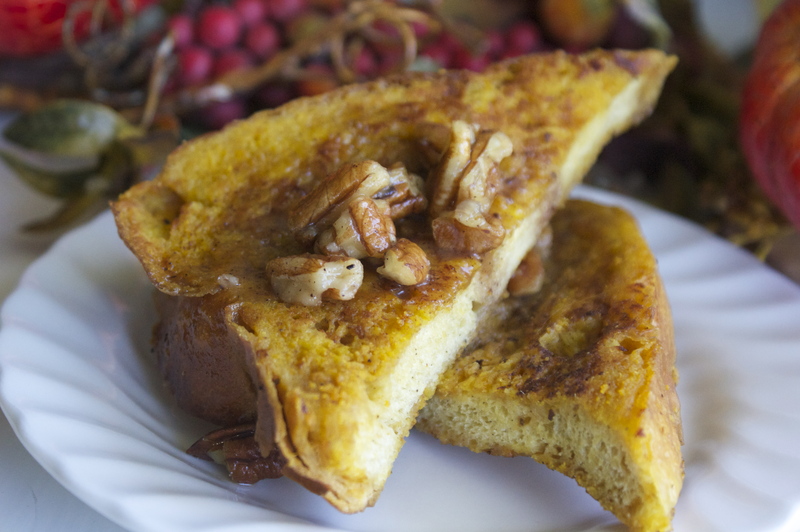 Enjoy pumpkin french toast and wet maple spiced pecans with Washington Irving’s The Legend of Sleepy Hollow, and check in at http://warandpeach.com for future recipes and book reviews.